Shower heads. Troubles and Solutions. Showers are fun when you take a bath, aren’t they? Showers are one of the loveliest devices invented when it comes to bathroom accessories. Showers are useful, but they can also be problematic if not taken care of properly. Let us take a look at the various problems that might arise when it comes to shower heads. What can go wrong with shower heads? 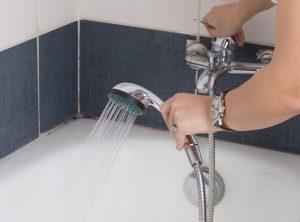 If your shower head gets clogged: there are places where the water supplied becomes hard water. This kind of water has mineral deposits. Regular bath can lead to accumulation of these minerals in your shower head. If they are not cleaned properly, it might lead to clogged shower heads. If shower heads and faucets are restricted: many at times, shower heads and faucets are restricted by the manufacturers themselves. This is done to save water in places where there is water shortages. These faucets restrict water. You can call a plumber to regulate these in order to get a steady water flow from your shower. Leakage in shower heads: you would often find that water is trickling down from the shower heads even after you have closed the tap. This means that there is some kind of leak in the shower head itself. in this case you would need get it checked by the plumber and change it if needed to. Irregular water supply: there can be times when you shower works but the water supply is disrupted occasionally. Even their is water supply available, the flow of water is traveling in a different direction. In these cases you usually need a plumber to fix this issue. Crystal water plumbers can help you handle these problems. They even give you a number of options regarding installation of new shower heads. You can install shower heads with a single nozzle. You can also get showers which have water that spreads out over a large surface area. These are called rain showers. You can also install hand showers. Hand showers help in reaching specific areas giving you a great bathing experience.